Sunderland members met at the gate today as a result of an attempt to impose new rotas. 18 jobs are at risk because its a plan to go from 1 in 4 to 1 in 6. the members and reps are determined to defend the right to collectively agree and vote on working arrangements and to defend the agreement on rotating. The reps were told its happening and they made it clear it's not. solidarity with our members in Sunderland. TrueBlueTerrier wrote: Sunderland members met at the gate today as a result of an attempt to impose new rotas. 18 jobs are at risk because its a plan to go from 1 in 4 to 1 in 6. the members and reps are determined to defend the right to collectively agree and vote on working arrangements and to defend the agreement on rotating. The reps were told its happening and they made it clear it's not. solidarity with our members in Sunderland. It works on several levels, Mags, Mackems, Management. It's usually 'Mags'.. a term coined by the mackems. 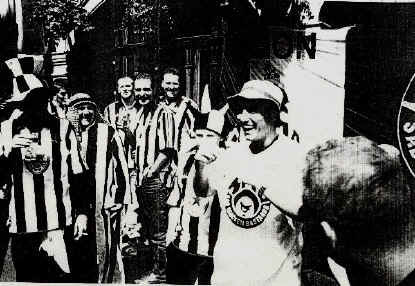 Geordies retaliate with SMB (Sad mackem Bastards). a know what it is mate. am a Geordie mesel. but they are asking for support for sunderland and the reply was FTM. obvious to me. . but I would still support work colleagues regardless of their team. I would think anyone would. It was a quip, if anyone is overly concerned as to my allegiances they can search my past posts which I am sure will include many FTMs when discussing management.